Ann Wickham was born on 9 September 1804 at Tewin, the eighth child of John and Sarah Carrington and grand-daughter of John Carrington of Bramfield whose diary covering the period 1798 to 1810 was edited by W. Branch Johnson and published as The Carrington Diary. Her grandfather recorded her christening. “Friday 16th [November 1804] To Tewin afternoon, to son Johns Daughter Anns Christning (sic) They had a Good [word omitted] and so had I after & plenty of good punch and Curant (sic) wine, Staid supper & 2 Companys at Cards, Broke up at 1 Clock with God Save the King with three Cheers, Gave Nurs (sic) Ambrose 1sh & Grant ye Maid 1sh, Mr Dean Godfather, Mrs Webb Mrs Rowley Godmrs, Webb, Rowley old, Rowley young, Pridmore & wife, Otway, & Clay &c. &c. their (sic)”. Ann was married in May 1825 to Edward Wickham, a Norfolk brewer some eleven years older than she and they settled in Hertford. Edward was recorded in the 1851 census as a brewer, employing one man and a farmer, employing 4 men. Ann died on 15 February 1873; Edward died on 12 May 1880. 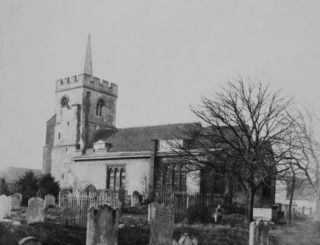 The Day book makes reference to their oldest son, William, born in 1830, who settled as a brewer at Ware and her daughter, Rosanna, christened at St Andrew’s church, Hertford on 18 January 1836. Rosanna was to marry Henry Ekins, enumerated in 1881 as a builder, employing 33 men and 4 boys. The Ekins web-site shows George, Rosanna’s father-in-law and founder of the firm. It was Rosanna who was credited with having made “an orderly and reasonable accurate transcript” of John Carrington’s diary. (See W. Branch Johnson, Memorandums for the Carrington diaries, Phillimore, 1973). It was a younger son, Edward, who kept the Wickens family brewery in Hertford going. He was advertising at the end of the century, with no doubt some pride, that the Mill Bridge Brewery was a Family Brewer, established in 1828. (See Hertfordshire Mercury, 13 April 1897). His daughter, Hilda, deposited the “Carrington diary” at the Hertford County Record Office in 1943. This was followed by other family papers. Ann Wickham’s Day Book is not a diary but a record of events recorded from time to time. It runs for just a few years from January 1852 up to February 1857. It is hoped that these extracts show Ann’s affection for children, her pride in her son, her involvement in the family business of malting and brewing, pleasure in outings and interest in local gossip. Poor little May taken worse and continued to get worse until Thursday 28th when it pleased God to release her from her sufferings for which we are all grateful as she was much afflicted. I went to London Mrs Norman went with me I went to the Court of Chancery about the Railway money being transferred to my husband The Hon Sir R Kindersley Vice Chancellor on the chair (A Very Nice Gentleman) Called on Mrs Balling then we went to tea with Mrs Tyier Mrs Norman’s mama Came home by the 9 train sup[p]ed with Mrs Norman When I get home there was a letter to say poor little May was dead She is buried at Swavesey. Poor Mrs Garner’s son hung himself in the Barn he was quite dead when found by his father who while cutting him fell and Broke three of his own ribs. John Carrington’s Diary has been edited by Sue Flood and reissued by the Hertfordshire Record Society.